The International Cycling Union is to investigate alleged links between Astana and Lance Armstrong's former doctor Michele Ferrari. Ferrari, given a lifetime sporting ban in 2012 for his part in the Armstrong doping affair, denies claims that he visited the team last year. UCI president Brian Cookson has asked to see legal documents relating to allegations in the Italian press. He said: "This is a relatively new development. It sounds very serious." It puts another question mark against whether Astana, the team of 2014 Tour de France winner Vincenzo Nibali, will be granted a racing licence with a decision from the UCI due on Wednesday. Cookson, in Monaco for the International Olympic Committee, added: "We were aware that there were investigations going on. 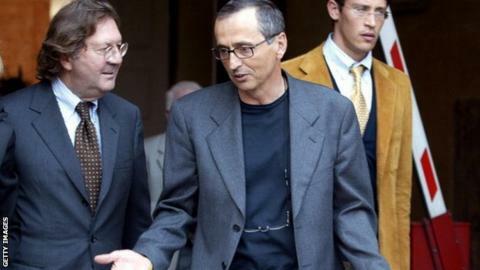 "We understand the file has been sent by the magistrate to CONI (Italian Olympic Committee). We have been in touch with CONI to share that information with us. "At the moment that will not have been taken into account by the licensing commission, so that's new. "We need to see the evidence, we can't take action based on a newspaper report." Last week, the UCI announced it had approved licences for 16 teams. It delayed decisions until this week on Team Europcar and Kazakhstan-based Astana. In October, the UCI asked its licensing commission to review Astana's status after brothers Maxim and Valentin Iglinskiy, as well as trainee Ilya Davidenok, failed doping tests. Cookson added: "We will take a decision in good time, through due process. "I think it's really important when you make decisions of a really serious nature that you do it with everything in the right order with the right legal support and also the support of World Anti-Doping Agency. "That's what we take great strides to try to achieve." Astana declined to respond to the latest allegations.